We hold Buddhism and Meditation Classes at Dechen London: Sakya Buddhist Centre on Wednesday evenings, Thursday and Saturday mornings. We also hold classes in Richmond on Thursday evenings. These meditation classes are an ideal way to learn to practise a simple meditation technique and find out about Buddhism itself. 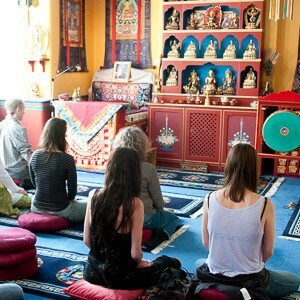 Sessions last for one hour and are led by friendly and experienced Buddhists. Each starts with full instructions on the meditation practice, sometimes followed by a concise talk about a particular aspect of Buddhism. After the session, there is plenty of time for questions, conversation and refreshments as well. All classes teach a simple meditation technique called samatha, a Buddhist practice for calming the mind. This simple but powerful practice helps you develop a clear, relaxed and stable state of mind. The method is fully explained by an experienced instructor and there is plenty of time to ask questions. What is Buddhism for? It is one of the Buddha’s fundamental teaching that we suffer, human beings and other type of beings, we all suffer but we all want to find a way to happiness. All beings want a way to happiness, to freedom from suffering and to goodness, to live a good life and also to die a good death, which is again another aspect of happiness. So this what Buddhism offers, a way to authentic freedom from suffering and to profound happiness. These introductory meditation classes comprises a short session of a meditation followed by a concise talk about a particular aspect of Buddhism. All of the Buddha’s teachings were given to help relieve suffering (our own and that of others) through developing our natural qualities of wisdom and compassion. They are as applicable today as ever because the way our hearts and minds work has not changed. Give yourself some space from the overwhelming energy of the busy city and come to listen to some words of wisdom, question them, try to understand them and experience their meaning in meditation. Some short videos will be shown and there will be time for discussion and meditation. What is Buddhism? What is Karma? How does Buddhism help us in everyday life? How do we meditate? These are just some of the topics which will be presented. Come and dip your toe in the ancient stream of Buddhist meditation. The calming benefits are felt by all, beginners included, and help us approach life’s challenges with a fresh and responsive mind. Peter and Tony teach a range of techniques, from simple mindfulness meditation to methods which tap the depths of our emotions. Between them, Tony and Peter have many years of experience learning and practising meditation under the guidance of Japanese and Tibetan masters as well as the English-born Lama Jampa Thaye. This introductory class comprises two short session of samatha meditation. What is Buddhism? What is karma? How does Buddhism help us in everyday life? How do we meditate? Come and join us on Saturday mornings and find out more about the essential teachings of Buddhism. The classes will be led by an experienced instructor and there will be plenty of time for questions. As your understanding increases and your meditation practice becomes more stable they will become the basis for developing insights into the nature of your mind which in turn allow the qualities of wisdom, compassion and loving kindness to naturally arise. In the Sanskrit word, the first two syllables, sama, refer to “peace, calm” and “slowing or cooling down”.The second syllable tha means to remain or abide. Most of the time, our mind is a whirlwind of agitated thoughts. Our thoughts are obsessive concerns with the past, conceptualization about the present, and concerns about the future. This means that, generally, our mind is not resting peacefully and experiencing the present moment at all. Samatha, calm abiding, which steadies, composes, unifies and concentrates the mind. This is a experience of peaceful happiness. Vipassanā, insight, which enables one to look into, explore and understand conditioned phenomena. This is an experience of seeing into the nature of things and having clear understanding of the world and our minds. These two mental qualities of calm abiding and insight are the ways to gain realisation and Buddhahood. Later Buddhist Masters like Asanga (4th CE) taught the Nine stages of abiding or training the mind and Atisha (10th CE) incorporated samata into the Lo-jong or Mind Training teachings. 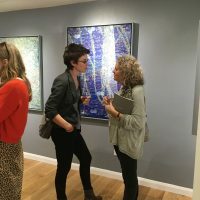 For further information on any of our classes, contact us at london@dechen.org.